GOLDEA exports to more than 70 countries, professional in exporting. 1.Board : Goldea apply E1 and E0 MDF board, high density ensure a stable and strong door for you. 2.Goldea apply 45cm finger-joint skeleton, with wood moisture content of 10%-12%, which is twice stronger than natural timber. Such kind of quality control ensure you a quality door. 3.Goldea apply thick four sides PVC edge banding (80s), which will prevent the damage during transportation, and also it is super waterproof. Various pattern options: relief door is the most competitive door for its simple pattern. 1.Goldea apply German Homag cutting machine, with automatic loading and unloading system, reach size accuracy 10s, achieve the goal of one worker for whole work line. 2.9 Taiwan engraving machines with diamond drill bit, which can ensure smooth line. 3.Dust free glue spray room with spinning shelf can make sure even spread glue on panel surface, which also provide worker a good working environment. 4. Lamination machine provide a good adhesion environment for PVC film, 60 seconds lamination time guarantee quality PVC filmed board. 5. 26 cold press machine will toughen the door and also ensure a shining surface. 6. Sawing machine achieve simultaneous cutting of two edge, which will not deform the door. 7. Goldea apply transportation line from the start to the end, which protect the door surface, and we are also the only user in China. 8. Japan hole drilling machine guarantee accurate hole position, depth and size. 1.Which products is your company specializing in? Our company is specializing in manufacturing wooden interior doors, decoration board/line, sanitary warehouse, priority wood plastic environment-friendly decorative material. 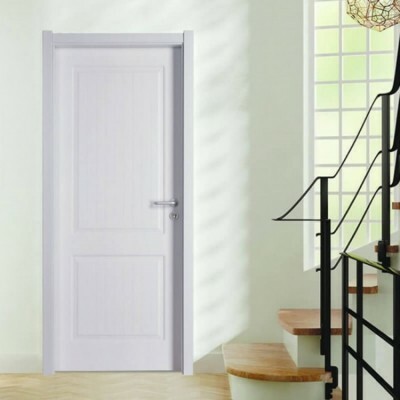 They include the Individual relief interior door series, sectional compounding interior door series, Painting series, closet door series, bathroom furniture series, cabinet door series, small and big door series, porch sliding door series, etc. 2.Does your factory produce the painting doors? Yes, we make the painting doors, they include the Individual relief interior door series, sectional compounding interior door series, Painting series, closet door series, cabinet door series, small and big door series, porch sliding door series. 3.How can I make the deal with you? First, send us your enquiry. Then the quotation will be sent to you. If you approve the order, we will make the PI to you, then make the payment. After receiving the deposit, we will begin to make the door. Before loading, please pay the balance. We will arrange the delivery. When the goods reach you, there will be about 10 years after-sales service. 4. What’s your MOQ? Do you need the small order? We don’t have the MOQ, small order is acceptable.